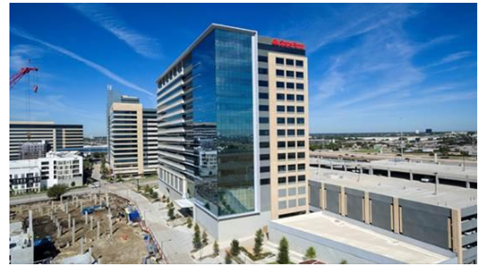 ​​RICHARDSON - Developer KDC has completed the fourth tower of State Farm Insurance's regional hub, which now totals 2​​​.1 million sf of office space within the CityLine mixed-use development. The company has already begun moving employees into the 12-story, 500,000-sf tower at the northeast corner of State St. and N. Plano Rd. The tower is situated above a five-level parking structure with about 30,000 sf of ground-floor retail. So far, CityLine includes the four State Farm towers, a Raytheon office complex and nearly 50 restaurants and retail shops, which includes Whole Foods. ​Want commercial real estate data? See DFW Market Research​ for office, multifamily, retail and more!